Gray’s Reef was a new shade of green on St. Patrick’s Day! 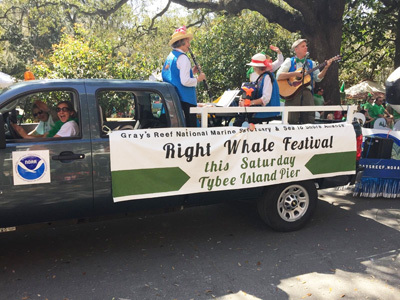 Gray’s Reef participated in Savannah’s historic St. Patrick’s Day Parade. With over 100,000 people lining the streets to cheer for the parade progression, and more than 200,000 others tuned in to live coverage of the event on local television and streaming webcast, this event put Gray’s Reef in front of a sea of Savannah’s residents and visitors. 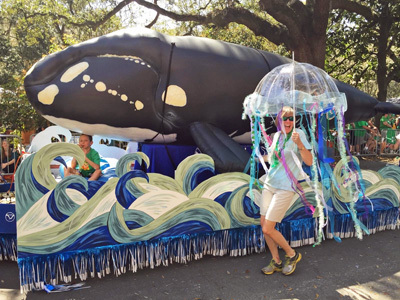 Riding in on a wave of enthusiasm, with a lifesize inflatable North Atlantic right whale calf harnessed to the float, and with staff and volunteers costumed as sea critters and jovial jellyfish, Gray’s Reef made a real splash at this popular event. Gray’s Reef seized the parade opportunity for the first time this year with a goal to raise awareness of the sanctuary, and of the upcoming FareWhale Festival. Two Sea Grant/MAREX interns plan to enter graduate school later this year. 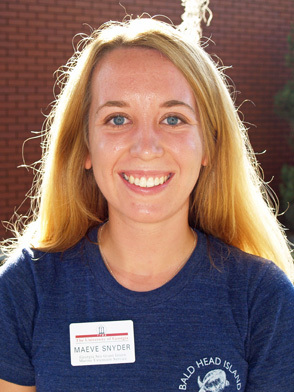 Maeve Snyder will pursue a M.S. in Biological Sciences at the University of South Carolina. 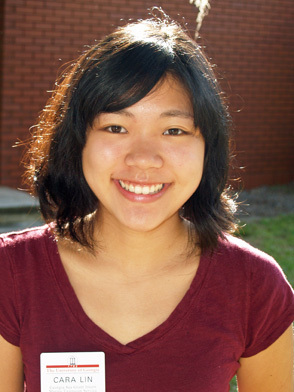 Her anticipated research will focus on the effects of climate on the biogeography of marine intertidal invertebrates. Two UGA grad students working in the Byers Lab at Priest Landing are asking citizen- scientists to help them track invasive seaweed. 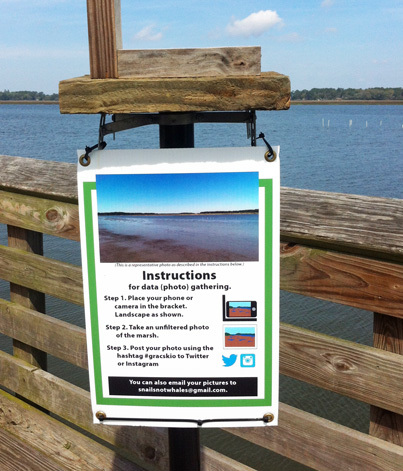 Kaitlin Kenney and Linsey Haram devised the project that asks visitors to the Jay Wolf Nature Trail dock to take pictures of the shoreline and post them on social media. The UGA Marine Extension will present a two-week course aimed at teachers and focused on the Georgia coast from June 7-21. Except for a $100 non-refundable deposit, the fees for the course will be covered by an “Improving Teacher Quality” grant from the U.S. Department of Education. 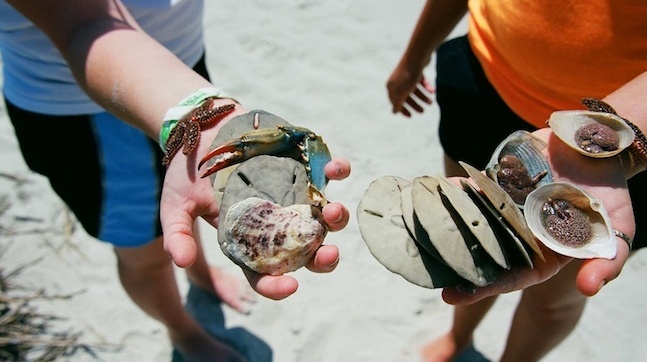 The course will begin with an overview of basic marine ecosystems in coastal Georgia. Activities aboard the R/V Sea Dawg will include biological sampling of the estuary and water chemistry analysis. Laboratory activities will include the collection and identification of plankton, invertebrates and fish. Participants will explore scientific inquiry methods with applications for classroom use. 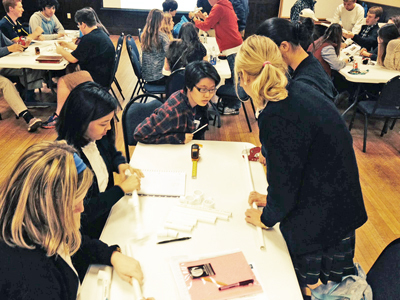 “They will complete all the steps necessary to design a research project, collect data and report the results in a fun way,” said MAREX educator Mare Timmons. The two-week course is based at the UGA Marine Extension Service Marine Education Center and Aquarium. Housing will be dormitory style and cafeteria meals are provided during the course with the exception of a few “dinners out”. Participants must be able to stay onsite for the entire program; commuting is not allowed. The dorm and cafeteria are air conditioned, yet much “classroom” time will be spent outdoors. Moderate physical activity is involved and participants should be in good health. Enrollment is limited to 16 students. For more information and application instructions, visit: http://marex.uga.edu/graduate/ or contact Mare Timmons at mare@uga.edu. 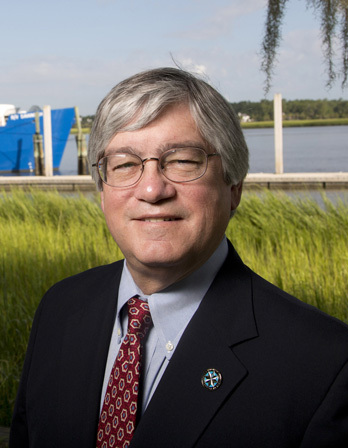 Skidaway Institute Executive Director Jim Sanders was re-elected for a three year term to the Board of Trustees, Consortium for Ocean Leadership, March 2015-2018. The Consortium for Ocean Leadership is a Washington, DC-based nonprofit organization that represents more than 100 of the leading public and private ocean research and education institutions, aquaria and industry with the mission to advance research, education and sound ocean policy. The organization also manages ocean research and education programs in areas of scientific ocean drilling, ocean observing, ocean exploration, and ocean partnerships. The Ocean Leadership Board of Trustees consists of 14 Trustees elected from among the membership, who are charged by the Members to represent the best interests of the broad ocean research and education community. Gray’s Reef National Marine Sanctuary uses underwater robots (remotely operated vehicles or ROVs) to remotely observe the natural resources found within the sanctuary and surrounding areas, and as a way to get middle school, high school and college students excited about science, technology, engineering, and math (STEM). Students working in teams to design remotely operated vehicles(ROVs) during the Savannah Science Seminar. Jody Patterson, Volunteer Coordinator for Gray’s Reef, is also the Southeast Regional Coordinator for the MATE ROV Competition in Savannah, Ga. She is worked with 36 students from secondary high schools in Chatham County as part of the Savannah Science Seminar through January 21st. The focus of this sanctuary program and workshop was to develop stewardship for our ocean and marine habitats by engaging and inspiring students and educators with ocean observing technologies. Our 2015 Gray’s Reef Ocean Film Festival and the launch of the newly founded Gray’s Reef National Marine Sanctuary Foundation has left Gray’s Reef staff and the Savannah community buzzing with energy and motivated to plunge into the new year with a renewed sense of inspiration for protecting our ocean and Gray’s Reef. Special guests included oceanographer, conservationist, and National Geographic explorer Dr. Sylvia Earle with her film Mission Blue, and visual effects specialist and Deep Sea Challenge film director John Bruno. 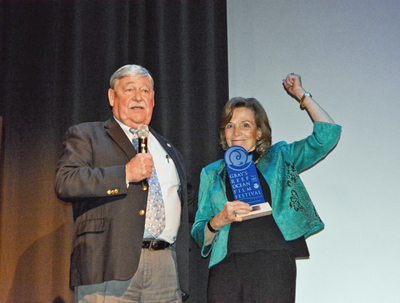 Sylvia Earle receives a Lifetime Achievement Award on stage with Billy Causey, Southeast Regional Director of the Office of National Marine Sanctuaries. Complimenting these exploration films was Swain’s Island, bringing light to the natural system, history, and culture of the Sanctuary. A few other very special guests to the festival included our own fearless leader, Director of the Office of National Marine Sanctuaries Dan Basta and Regional Director of the Southeast Atlantic, Gulf of Mexico, and Caribbean Region Billy Causey, with President and Vice President of the National Marine Sanctuary Foundation Jason Patlis and Allison Alexander, and NMSF board member Jim Crowley. 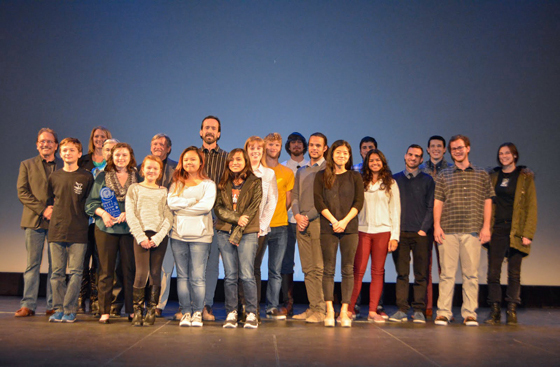 Awards were given to 1st, 2nd and 3rd Place Winners of the 2015 Emerging Filmmakers Competition. An all-hands-on-deck event, the success of this weekend festival is attributed to the commitment of the full staff of Gray’s Reef with more than a dozen volunteers, and the additional support and attention of these national and regional leaders.